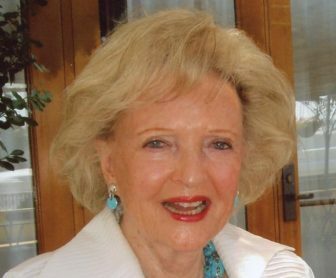 Geraldine Harrington Woods, a much loved long-time resident of Darien, passed away peacefully on Oct. 22 at the age of 92. Gerry was predeceased by her husband, Robert Evans Woods, who passed away May 30, 2017. Geraldine Woods, 92, passed away on Oct. 22. Her funeral will take place on Nov. 28. Gerry was renowned for her beauty, intelligence, open-mindedness, wit and style. As the perpetual belle of the ball, she entertained with great charm. She cultivated and maintained strong friendships throughout her life. Gerry was born July 13, 1926 in San Francisco to Gerald and Margaret Harrington. Gerry attended Smith College until she married Bob the day after he graduated from West Point as first captain in 1945. Because he had just appeared on the cover of Time magazine, their wedding was featured in newsreels at the time. Gerry also attended Hunter College. She and Bob moved frequently for Bob’s career until they settled in Darien in 1962. Except for a few years living in New York City, they remained in Darien the rest of their lives, where she was very active in the community, including her career as a real estate agent for over 20 years. Gerry and Bob were inseparable during their 72 years of marriage. They loved to travel the world, collecting experiences and friends wherever they went. The Tokeneke Club served as their summer home for many decades, where they habitually held court amongst merriment and music. Prior to Tokeneke, they enjoyed their memberships at Wee Burn and Country Club of Darien. Gerry is survived by her three sons and their wives: Bob Jr. and Mary, Jerry and Kate, and Chris and Debbie; five grandchildren: Avery Woods (and Erik Schuchmann), Baker (and Nicole) Woods, Ashley (and Kyle) Hollister, Robert Woods and Morgan Woods; and four great grandchildren: Dexter and Milo Schuchmann and Theodore and Hannah Hollister. A Memorial Mass will be held at 2 p.m., Nov. 28 at St. John Roman Catholic Church in Darien. Geraldine along with her husband, Robert, will be interred at West Point Cemetery.